So today I thought I would take a quick look at what St Patrick was all about. So I consulted good old Wikipedia. "When he was about 16 he was captured from Britain by Irish raiders and taken as a Slave to Ireland, where he lived for six years before escaping and returning to his family. After entering the Church, he returned to Ireland as an ordained bishop in the north and west of the island, but little is known about the places where he worked. 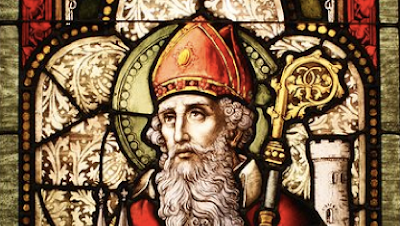 By the eighth century he had come to be revered as the patron saint of Ireland." So an adolecant captured slave becomes a venerated Saint celebrated still after nearly 2 millenia. Sounds like the sort of thing God would do! Many happy returns to all! Trusting God will start revival over here - we badly need it.